A deck is a popular home improvement that not only adds to the value of your home but provides a focal point for enjoying the outdoors. You’ll want to consider carefully the design elements that go into your deck – it should include the features that match your lifestyle and complement the deck design of your house. Planning is the most important part of building a deck because, chances are, you’ll be living with your design for a long time. There are several considerations when planning and designing a deck. The most important factor in deck design is how you will use it. Do you entertain frequently, and if so, how large a group will you need space for? What kind of seating will you need–would you or your guests be more comfortable on built-in benches or patio furniture? Do you want the space arranged to accommodate conversations between small groups or in one large common area? Will you need adequate lighting to entertain at night? Try to imagine all the ways you’d like to use your deck because most design elements will be based on those kinds of preferences. Chances are, the size and orientation of your property and house limit you to one or two deck locations. But within those limits, you may have more choices than you think. You may be able to add a door, build a walkway or incorporate a privacy screen that will allow you to locate your deck, so it is most convenient for your intended uses. The climate in your area and the views you’ll see are the major factors to consider when deciding where to place your deck. A north-side deck will probably be the coolest location. Southern or western orientations may be too warm in the middle of the summer unless you include an overhead screen or build the deck around an existing shade tree. You may be able to avoid prevailing winds by locating your deck where the house will provide some protection. Likewise, careful placement can minimize traffic noise, eliminate unwanted views or provide additional privacy. If you plan to include a hot tub or swimming pool in your projects, privacy considerations for you and your guests may be imperative. Before you decide on a location, first check local zoning ordinances. They will limit the overall size of your deck, height of any privacy screens and the minimum distance from your deck to your lot lines. Neighborhood or subdivision covenants may restrict the appearance of the structure, and you’ll have to get approval for your design. Also, check with the local building department to find out whether you’ll be required to have a building permit and what kind of plans you’ll have to submit. Finally, be sure to check with your local utility companies to make sure you won’t run afoul of utility rights-of-way and to locate buried pipes and utility lines. 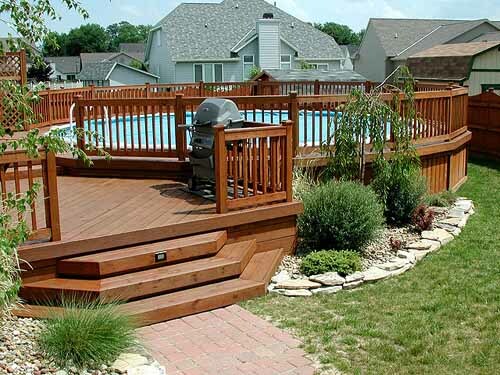 You can build any size deck you want within legal limits. But even within those limits, a deck can be either too big or too small. The most important consideration (aside from cost) is use, but a huge deck can look out of place next to a little house, just as a tiny deck seems wrong with a big house. If you think your dream deck is too large for your house, break up the expanse by building smaller sections on multiple levels. * To test your ideas, measure the size you want on your lawn. Drive 4′ stakes at the approximate corners, then tie the string between them at about the height of the railings. Set your lawn furniture in the area to get an idea of how space will work. The most common mistake people make is building a deck too small. The difference in cost between a deck that is a little too small and one that is the right size usually isn’t that much. * One tip: If possible, size your deck in 2′ or 4′ increments. You’ll have to buy standard lumber lengths anyway, and there’s no point in wasting that material when you could have a larger deck for the same amount of money. There are a variety of decking patterns you can use, including herringbone, diagonal and checkerboard. A more complicated deck will likely require more materials. Building codes will determine the configuration of your stairs, including the rise, run, and passage width. Draw a to-scale design of your deck on graph paper to price accurately all the materials you’ll need. A deck can be any shape you want, and in fact, simple changes like an angled corner or a 45-degree decking pattern can dress up a house with a long, plain wall. Of course, a more complicated deck is harder to build and may require more materials. You can also add visual interest by wrapping the deck around a corner, adding built-in benches, integrating a fence or screen on one side or even adding an overhead screen. Usually, the decking should come to within 2 ” of the bottom of the access door from the house, with steps leading from the deck to the ground. On sloped ground, you may want to build your deck in multiple levels to follow the slope. Typically, wherever the deck is more than 48″ off the ground, codes require that the posts be braced to prevent swaying and rocking. * Cutouts–A spa or hot tub can be set on the deck if the structure is reinforced to carry the weight of the water, or it can be adjusted directly on a concrete slab on the ground with the deck built around it. Existing trees and rocks can also be integrated into the deck by framing around them; then either cap the ends of the decking or contour the decking to the shape of the obstacle. If you work around a tree, leave at least 3″ on all sides to allow for growth. Around a stationary object such as a boulder, leave about 1/4″ so the decking can expand and contract with temperature and moisture changes. Railings are the most prominent visual element in a deck and offer an excellent opportunity to use your imagination and creativity. They may be fastened to posts that run all the way to the ground, along the sides of the rim joists or attached to the decking itself. They may include wood, metal or even rope–nearly anything that satisfies structural requirements. Your railing design will be limited primarily by building code regulations that are intended to ensure safety. Typically, those codes state that support posts may be no more than 6′ apart and that the railing may have no spaces larger than 4″ x 4″. 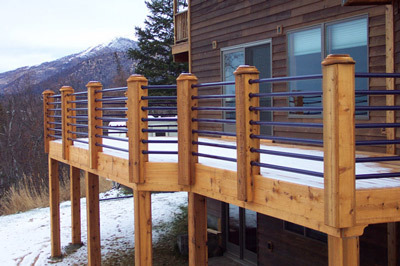 The durability of your railing will also be affected by the design. For example, the ends of the railing posts should be covered or cut at an angle to shed water, to minimize cracking and splitting. Step and stair construction is strictly regulated by building codes. As a rule, steps and stairs should be at least 36″ wide–60″ if you want two people to be able to pass each other comfortably. The rise (vertical distance between steps) should be no more than 7-1/2″ and the width of a thread at least 10″. The slope should not be too steep–a 7″ riser with a 10-1/2″ tread is a typical combination. Building codes will also govern how the stair is supported and attached and whether or not you need a railing. 1. Vertical posts are set in concrete or on piers set on a concrete footing. They are typically spaced 4′ to 8′ apart. 2. Horizontal beams are set on the posts parallel to the decking to carry the weight of the deck. 3. Joists are run between the beams, typically 16″ or 24″ apart. They distribute the weight of the deck and allow you to use decking boards that wouldn’t be strong enough to span the distance between the beams. 4. Decking is laid over the joists to form the “floor” of the deck. 5. Railings are usually 36″ to 42″ high, designed so no spaces between balusters are greater than 4″. The materials used, and the size and spacing of these components, are specified by local building codes. Deck materials must not only be resistant to decay and insect damage but also withstand the effects of water and sun. Standard construction lumber such as fur, pine or spruce may be treated to protect it from rot, but it won’t hold up under extreme weather conditions or the ultraviolet rays in sunlight. You’ll get much better durability by using pressure-treated pine, redwood or cedar. The pressure-treated material is the least expensive and can be stained to nearly any color you want. Redwood and cedar offer an added advantage in that they are soft, fine-grained woods that will resist splintering. If you use redwood or cedar, remember that only the heartwood–the reddish-colored portion of redwood or the dark brownish-orange part of a cedar board–is decay-resistant. The lighter-colored sapwood will deteriorate just as quickly as pine or spruce.